I love using the bright colors for the fruit. My favorite were the green apples which seemed to be the least popular with the kiddos as that was the only ones I had left. This was also the largest project I have done to date for my Halloween trick or treat goodies. It’s so much fun to see the responses from the kids and parents. It really has been fun and thankful we live in a small neighborhood so I can do this as this would not be possible if we got just an insane number of trick or treaters. I used Planet June’s apple pattern for the apples. 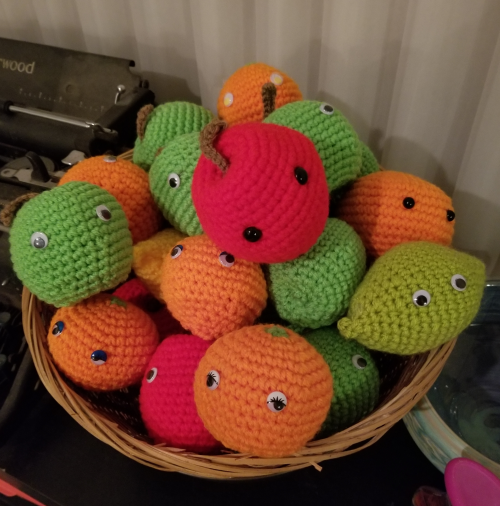 The other fruit I didn’t use a pattern. It is getting close to the time of the year where I start making the Halloween crochet items. I have some ideas but haven’t finalized what I will be making.